https://sep.yimg.com/ay/yhst-33477391359232/bariene-tang-acanthurus-bariene-bariene-surgeonfish-blackspot-tang-eye-spot-tangs-5.jpgBariene Tang - Acanthurus bariene - Bariene Surgeonfish - Blackspot Tang - Eye-Spot Tangs ModeratePeaceful100 Gallon20 inchesYesHerbivore, AlgaeIndo-PacificSmall 2" - 3"
Bariene Tangs, aka Blackspot or Eye-Spot Tangs, are not often seen in the aquarium trade. Though somewhat drab as juveniles, they develop beautiful adult coloration. This is one of the Tangs that rewards its owner with a much more attractive coloration as an adult versus a juvenile. It can grow to a large size so should be housed in tanks at least 6 feet long. It will show typical large Tang aggression towards other similar fish as it matures. Sometimes called the Black-Spot Tang, it will require a herbaceous diet and plenty of open space for swimming. Bariene Tangs are originally from the waters of the Indo-Pacific Ocean. Bariene Tangs grow to around 6 inches at full length and should be kept in an aquarium of at least 75 gallons in size to provide plenty of swimming and living room for them. Bariene Tangs are Herbivores, and should be fed a steady diet with plenty of vegetables and herbivore preparations. Bariene Tangs are peaceful members of the aquarium, and should not be kept with more aggressive species that may attack or bully it. 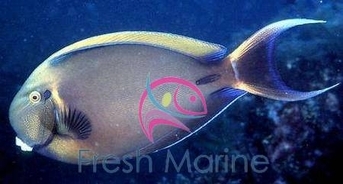 Bariene Tangs are easy to care for, and can be kept even by the beginning aquarium owner with little problem. Maximum Size: This species grows to 20 inches in length. General Size: This Bariene Tang is about five to eight inches in length. Minimum Tank Size Suggested: A 100 gallon or larger aquarium provides a good environment for these Bariene Tang. Tank Conditions: The Bariene Tang should ideally be kept in temperatures between 72 and 78 degrees Fahrenheit. A pH value of 8.1 or 8.4, and a specific gravity of 1.020 to 1.025 should be maintained. When kept with invertebrates, the specific gravity range should be 1.020 to 1.025, for the invertebrate species. In a fish only aquarium, the specific gravity should fall between 1.020 and 1.023. Feeding and Diet: The Bariene Tang fish is a herbivore. Its main diet consists of marine algae, having an unusually long digestive tract to digest the plant matter they eat. They are constant feeders and in nature spend most of their day grazing. A habitat with algae growth is good for them, which in turn helps to keep the algae in an aquarium cropped and in check.